Odd and the Frost Giants by Neil Gaiman (Author), Brett Helquist (Illustrator)is $1.99 today in ebook format. The Eyre Affair: A Thursday Next Novel by Jasper Fforde is $2.99 today only. [The teacher] stimulates an animated class discussion by showing a "Jack and the Beanstalk" cartoon in class. Summarizing the discussion, Dadier encourages the young men to consider the real meaning of what they hear and to think for themselves. 01:15:40 -Teach, how about some more stories? -Yeah, a story about football. 01:15:43 Hey, teach. Maybe I'll turn out to be a critic on the movies. 01:15:47 How did you like Jack and the Beanstalk? Turned out to be a thief. 01:15:50 I liked the story. 01:15:56 -So you finally got through to them. -I think so. The film is slated to air on TCM again on MONDAY, JANUARY 21, 2013 @ 08:00 AM (ET). Grimm: Season One is $16.99 in DVD format at Amazon and Target for the rest of this week. The Target ad also shows Once Upon a Time: The Complete First Season as $16.99 but it is not listed on the Target site, so Amazon is not price matching, at least not yet. So if you have a gift certificate to either place and didn't get these on your wishlist, these are the lowest prices to date on these sets. 1.) The Annotated Brothers Grimm (The Bicentennial Edition) edited & translated by Maria Tatar. Though I have the previous edition, I can't resist also wanting this new one for the expanded content. 2.) The Fairy Tales of Charles Perrault (Calla Editions) illustrated by Harry Clarke. These Calla Editions look gorgeous! 3.) Off with Their Heads! 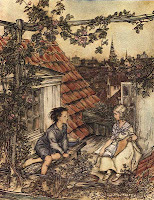 Fairy Tales and the Culture of Childhood by Maria Tatar. I think I side with Tatar over Bettelheim and have been wanting to read this one for a while. 5.) The Complete Fairy Tales (Penguin Classics) by George MacDonald. I had never heard of him until I stumbled upon his tale "The Light Princess," and now I must read the rest of his fairy tales! (From Heidi: Two wishlists included George MacDonald collections. While all of his books are available for free reading online, I understand the desire for a paper copy. 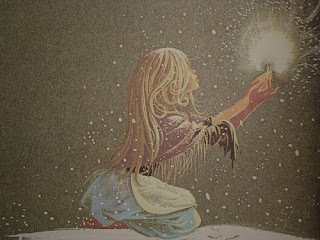 I'd like to recommend finding editions of MacDonald's most popular tales illustrated by Maurice Sendak, and others, such as The Golden Key (A Sunburst Book) and The Light Princess (Sunburst Book) .